Shane Lowry — armed with a new putter from his huge collection — tops a star-studded leaderboard at the halfway stage of the ISPS Handa Wales Open after a flawless second round 65 at The Celtic Manor Resort, but admitted his position was something of a surprise, writes the European Tour. The Offaly ace, who has recorded all three of his top-ten finishes this season on British soil, carded six unanswered birdies to move one ahead of first round leader Joost Luiten and big-hitting Belgian Nicolas Colsaerts on nine under par. The 2012 winner Thongchai Jaidee and Italy’s former Ryder Cup star Edoardo Molinari are a shot further back on seven under, while one of Europe’s Team members for next week’s contest at Gleneagles, Jamie Donaldson, maintained his chances of becoming the first Welsh winner of his National Open with a second round 67 that left him five under. Lowry, who put a Tank putter in his bag this week reaped the rewards by averaging 27 putts for the first rounds, has made just one cut in four previous visits to the 2010 Ryder Cup venue. That was four years ago, when he finished 39th. But the two-time European Tour winner, who gave himself a close to a dozen birdie chances, is delighted to grab a rare halfway lead and determined to enjoy his weekend. He said: “I'm pretty happy. I've never, ever done well here before, so to be leading after two rounds is nice. “There is still a long way to go in the tournament but I'm really looking forward to the weekend. “I didn't drive it that good yesterday but still shot a decent score. I drove it a lot better today, drove it a lot straighter and gave myself a lot of chances and rolled in a few putts, so it was nice. Ryder Cup wild cards Stephen Gallacher and Lee Westwood experienced differing results but similar emotions. While Gallacher headed home in relaxed mood despite seeing his preparations cut short by missing the halfway cut, Westwood was equally happy that a battling performance ensured he would have two more rounds to get his game into shape for Gleneagles. "Yesterday was quite tough," Gallacher admitted after a round containing two birdies - both on par fives - and one bogey. "It was tough to get going and get my head around it but today was a lot better. I was maybe trying a wee bit too hard yesterday and still thinking about next week. "I feel good, I'm physically and mentally good so I am really looking forward to next week. I'll get up the road this afternoon and relax this weekend and maybe play nine holes with Thomas (Björn) on Monday morning. I've done my preparation for it and I just want to get up there and get going." Westwood had also not played competitively since bowing out of the FedEx Cup play-offs after the first event, but recovered from an opening 73 with a 69 which featured two crucial birdies in the last four holes. "I needed a couple more rounds," Westwood said. "I was not particularly competitive yesterday, it was pretty scratchy, but today was more solid. A few iffy shots but it was nice to finish with two birdies in the last four holes to ensure being here for the weekend and two more competitive rounds. "I have been working on my game and been in the gym quite a lot, but I'm not quite match fit. I had three weeks off and you lose your sharpness." Team-mate Björn, who played alongside Gallacher, added a 69 to his opening 71 to lie two under par, with Donaldson’s 67 most impressive of the Gleneagles-bound quartet. Simon Thornton is tied for 22nd on two under after a 69 that featured a frustrating double bogey four holes from home. Damien McGrane (71-72) looked to be heading home when he bogeyed his 12th and double bogeyed his 13th holes (the fifth and sixth). But he birdied the seventh and ninth to make the one over cut on the mark. Michael Hoey (71) missed out by two with Gareth Maybin, who is battling to retain his card at 111th in the Race to Dubai, three off the pace on four over despite a rollercoaster 69. Kevin Phelan (73-76), David Higgins (78-72) and Peter Lawrie (73-78) also missed out and at 151st, 194th and 172nd in the Race to Dubai, they have a mountain to climb to make the Top-110 who keep their cards. Shane Lowry holed a four foot birdie putt at the last worth an extra €122,331 as he shared second behind Joost Luiten un the ISPS Handa Wales Open at The Celtic Manor Resort. Magnificent McIlroy strikes in Aberdeen, but can he keep it going? Not for the first time this season, Rory McIlroy started a tournament in brilliant fashion with a course-record 64 in the opening round of the Aberdeen Asset Management Scottish Open, writes the European Tour. 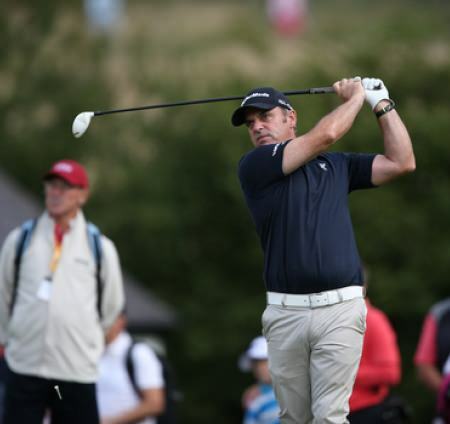 European Ryder Cup skipper Paul McGinley is in contention in the ISPS Wales Open. 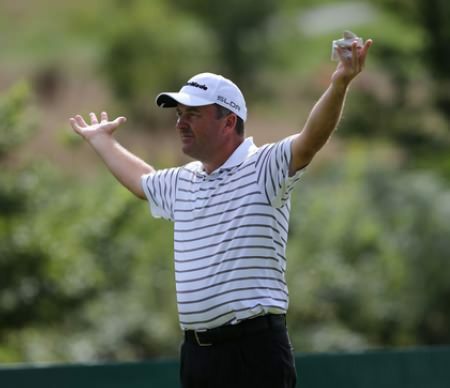 Picture: David Lloyd / www.golffile.iePaul McGinley showed his undoubtd class and put himself in contention for his first European Tour win for nearly eight years in the ISPS Handa Celtic Manor Wales Open. Damien McGrane acknowledges the crowd after a birdie two at the 13th. Picture: David Lloyd / www.golffile.iePaul McGinley crashed out of contention but Damien McGrane’s one under 70 left him within touching distance of a card-saving result - over even his first win since 2008 - in the ISPS Handa Wales Open. Damien McGrane gestures at marshals during the Wales Open. Picture: David Lloyd / www.golffile.ieProfessional golfers live in hope of that one big week that washes all the disappointment away. 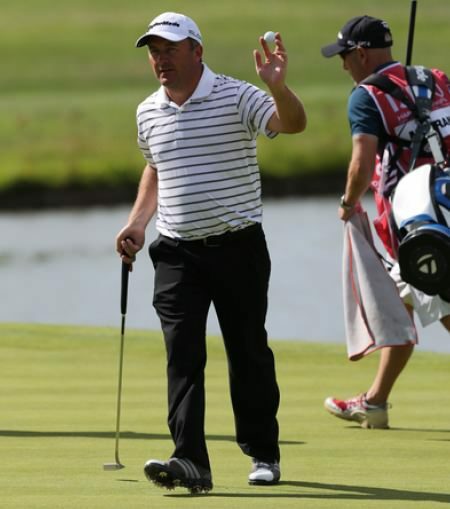 Damien McGrane finally had his at the ISPS Handa Wales Open.